Buying Plastic or Clear Glass Bottles- Oxygen and sunlight are the two biggest enemies of extra-virgin olive oil. So if you’re purchasing plastic or clear glass bottles, your oil is definitely going to be in trouble. When light comes in contact with the oil, it gets rancid and turns useless. Here on, go for bottles that are dark-green or brown in color. Keeping Your Oil Bottle near Heat- Keeping your bottle near the gas stove or near a window is a big no-no. Heat destroys the polyphenols in extra-virgin olive oil and lowers the flavor and quality of the oil. Always store your bottle in a cool and dark place. Evaluating the Oil’s Quality by its Color- Many people look for color as an indication of quality. The color of the oil just indicates when the olives were harvested and pressed and not quality. So don’t avoid the golden-yellow colored oil only because it looks different from what you are expecting. Believing that one oil fits All Kinds of Cooking- If you choose olive oil every day for all kinds of cooking, you’re making a huge mistake. Although everyday oil has a place in your pantry, make sure you select premium olive oil with more robust flavor for salad dressings and pasta dishes to make the dish shine through. Cooking on High Heat- High temperature cooking like frying and baking, destroys the antioxidants and alters the flavor of the oil. Make sure you don’t use olive oil for frying and for cooking at temperatures above 360°F. Cooking with Robust Oils- More robust, delicate oils should not be exposed to heat at all in order to protect their flavor and quality. Use these oils only as finishing oils in cold salads, pastas, and bruschettas. 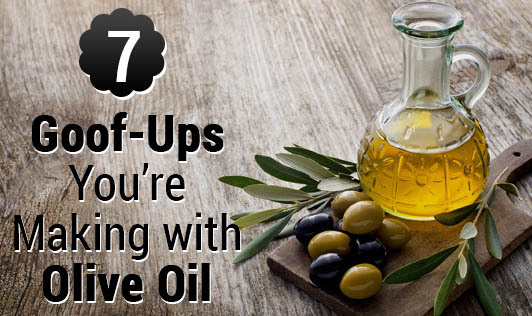 Storing the Oil for Long Periods- Have you stored a king-sized bottle of olive oil for years? Never repeat it again! The shelf-life of extra-virgin olive oil is 24 months and an over-stayed bottle would have lost all its health benefits and flavor.